Prefab Sprout’s shimmering masterpiece, Steve McQueen, began life in 1984 with the working title of June Parade. 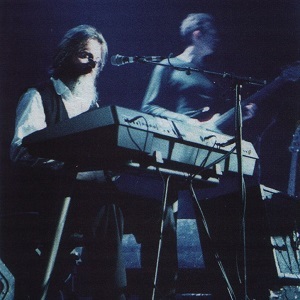 Led by writer, vocalist and guitarist Paddy McAloon, with his brother Martin and vocalist/ keyboard player Wendy Smith, the group had already created an intriguing presence on the music scene, operating outside of not just pop triﬂes, but also of most of the alternative bands out there. Their maturity was also marked out by the sleevenotes of their debut album, Swoon, which were written by friend of the group Emma Welles: “Anyway, it’s now very late and I’m listening to this record for the umpteenth time. My husband went to bed an hour ago – not that he has anything against the Sprouts, but he must get up early tomorrow. I won’t be joining him for at least another 40 minutes. That’s Swoon.” This was a world of married grown-ups, listening to adult music. 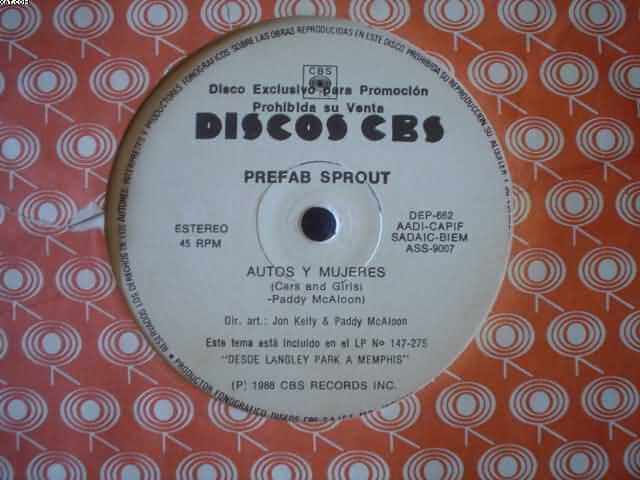 The initial Prefab Sprout sound was angular and strange. In leader Paddy McAloon, they had a witty, erudite spokesman. He was amused at the music press’ desire to pin them down. “I guess we’re somewhere between Rickie Lee Jones and Einstiirzende Whatsathingy,” he quipped to NME in 1984. “When people talk about 80s bands,” says brother Martin from his Newcastle home in 2007, “younger people now lump you all together. We get put in with Aztec Camera, Orange Juice and The Smiths. The only similarities really were the guitars and the check shirts. The guitars were similar because we had no money.” The McAloon brothers saw their competitors not as these jingle-jangle merchants, but major players Michael Jackson and Quincy Jones. The move to their second album, Steve McQueen, saw some of their dreams realised. Formed by Martin and Paddy in the mid-70s, the Prefab Sprout story starts on vinyl with their debut single, Lions In My Own Garden (Exit Someone), the title an acronym of the French town Limoges, where Paddy’s girlfriend had gone on holiday. Released on their own Candle Records in 1982, it was picked up by local heroes Kitchenware Records. The story of Prefab Sprout and Steve McQueen is inextricably linked with the story of Kitchenware, founded by Newcastle maverick Keith Armstrong. By coincidence, some months later, Muff Winwood suggested Dolby to Armstrong as a producer. The idea was not greeted with open arms: “Paddy and I didn’t get it at all initially. It wouldn’t have occurred to us. We thought Muff had gone mad. All we could think of was She Blinded Me With Science and all that.” The marriage of Sprout and Dolby was ostensibly odd. While Sprout screamed authenticity, Dolby, on the other hand, was seen as encapsulating all that was synthetic. Yet a listen beyond his funk-synth workouts and easily exportable comic book persona revealed a sensitive songwriter — just listen to the first side of his 1984 album, The Flat Earth. He’d also worked extensively with producer Mutt Lange on records by Foreigner, Joni Mitchell and Def Leppard. “I never cared much for the production of it,” laughs Martin. “Thomas redid the vocals to make it fit in more with Steve McQueen.” The shift in sound marked out the new direction that the group would be taking: losing the awkwardness, and gaining smoother edges. 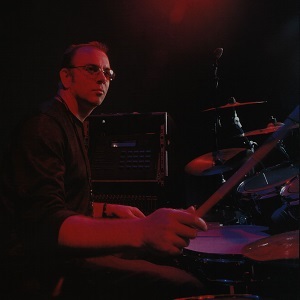 This was further aided by the arrival of a permanent drummer, session man Neil Conti, whose technical expertise brought the group to another level. “Neil was a fabulous musician, who could play anything,” Martin continues. “He’d play bass, guitar, or keyboards and he’s great. We felt somewhat inferior around his ability and his conﬁdence. He was very good”. “Thomas had a way of making you feel adequate in your own skin,” recalls Martin. “He’d say the right things to get the best performance from you. Steve McQueen was ready for release in June 1985. Its title, which allegedly came to Paddy one night in a dream, didn’t spring out of life-long adulation for the actor, who died in 1980. “It just seemed like an intriguing title for an LP,” he said in 1985. “He was really good in an un-arty way. He was never hyped up. It’s that instinctive feeling I like.” The sleeve parodied the sensitive image of Prefab Sprout; in a black-and-white photo, retouched into colour, the McAloons, Smith and Conti were all draped around a vintage motorcycle the same as that ridden by McQueen in The Great Escape. 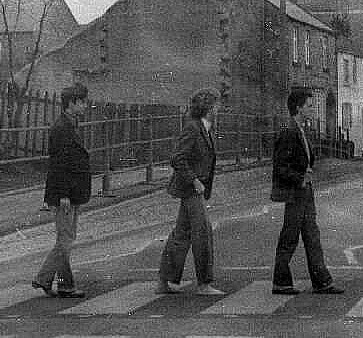 “I like playing around with the idea of how people will see us,” he told the long-defunct Blitz Magazine in 1985. “The LP sleeve is something you’d never associate with Prefab Sprout. So it’s a pretty superficial link between the title and the album… If it gets people’s backs up, then great.” It certainly got the backs of the actor’s estate up: they thought the group were making fun of the late star. In America, the album was released as Two Wheels Good. The album opened with the punk-like Faron Young, before taking the listener through 10 further ruminations on love, loss and despair. “One of things I love about it is that Paddy has a streak of exhibitionist in him, where he cranks his amp to 11 and hits a chord and screams at the top of his lungs,” Dolby recalls. “That was so beautifully balanced with the more intimate, breathy, melodic side, it’s very seductive. From the very first word on the album, ‘antiques’, the hardness and softness of it is really striking.” Aside from the vaudeville settings of Horsin’ Around or the cod-Italian restaurant sound of Blueberry Pies, which still sound clever for clever’s sake, the album is still fresh as the proverbial daisy. Standout track Goodbye Lucille #1, also known as Johnny Johnny, was originally conceived in waltz time. “That’s how we first played it back in ’77, in the era of punk. 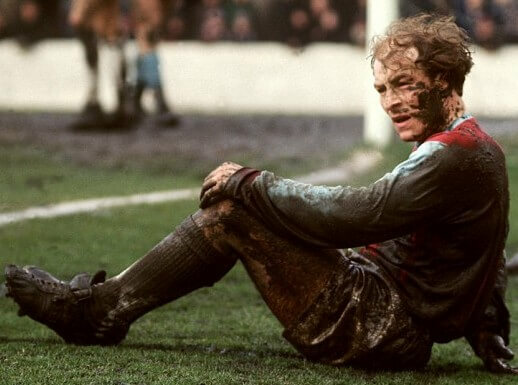 We sat round the piano, and we all sang it with our friends,” Martin remembers. The Goodbye Lucille title came as part of another scheme to have an album with tracks all of the same title, just numbered differently. “We had about eight Johnny, Johnnys in total. Three or four of them were piano versions and were quite beautiful, but we have no record of them, and I’m not sure if Paddy could remember them.” It was album full of lovely touches: Kevin Armstrong’s guitar lick on Hallelujah; Smith’s vocals; Dolby’s grand piano. Keith Armstrong was delighted with the final result. “I remember the first day I heard it; I listened to it on a Walkman and it was snowing,” he says. “I walked through the snow and thought it was the best thing I’d ever heard. Thomas completely avoided any of the signature 80s clichés — the keyboard stabs, the daft Phil Collins drums. He made a really classic sounding album.” The album was full of Fairlight samples — the banjo on Faron Young, the vocal treatments throughout — not that you’d really know. Steve McQueen is one of the best examples of band and machine playing unobtrusively together. The album was immediately taken to people’s bosoms. Rolling Stone called it “melodic pop, complex but irresistible”. It became a student staple, a record shop No 1. 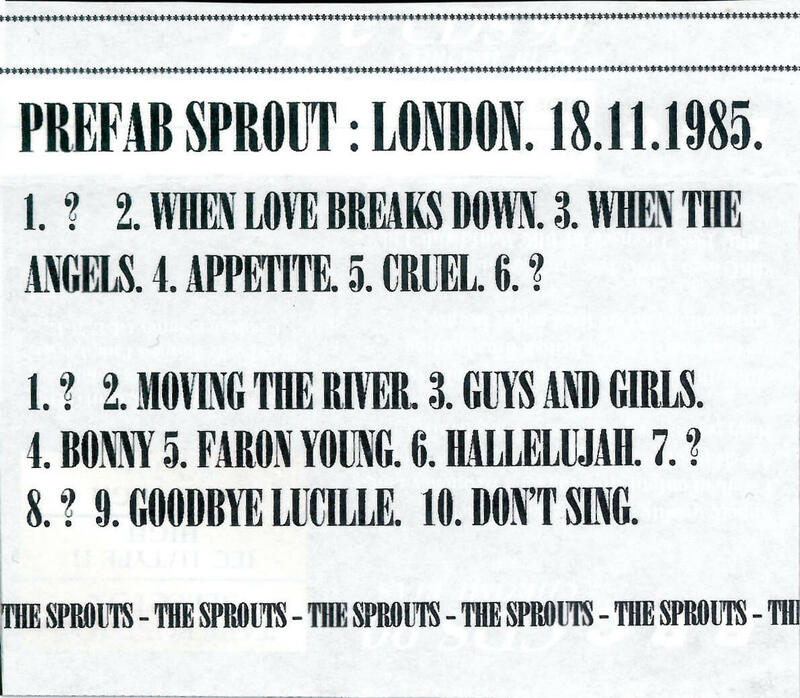 Brieﬂy, Prefab Sprout were everywhere. It’s amazing, however, that the album only got to No 21 and a great deal of the spotlight in the rock inkies was taken up by another album. “It still annoys me that the year that Steve McQueen came out,” Armstrong laughs, “The Jesus Si Mary Chain’s Psychocandy was the No 1 album of the year in NME. I don’t know why I should still be upset about that, but I am. We had a better record.” Steve McQueen sold somewhat less than Thriller in the end. The sound was so rich and full that the band decamped to make their basic, anti-Dolby record, Protest Songs, soon after. They went on to release some stunning work — including two more Dolby- produced albums, From Langley Park To Memphis and the ambitious Jordan: The Comeback. Their last album to date was The Gunman and Other Stories in 2002. They continue in their slow-moving vacuum to this day, never having formally dissolved, although Paddy McAloon’s health determines their future. Martin, after a long period of music lecturing, is now involved in band management and production. Wendy Smith is a full-time mother; Neil Conti lives in the south of France and is still an in-demand session man, most recently playing with Will Young. Thomas Dolby more or less invented the polyphonic ringtone and lives on the west coast of America, and Kitchenware currently look after one of most successful bands of recent years, Editors. With these new recordings, and Dolby’s lush remaster, hearing Steve McQueen again after so many years is reminiscent of returning to your childhood home and realising that the reality is actually better than the memory. “I was so chuffed how timeless it is,” Armstrong concludes. “Records like Aja are timeless, and I think Steve McQueen has that same quality, it’ll last Forever.” Thomas Dolby agrees: “It’s great. It was my ﬁrst production in the conventional sense, with a record company who had a band they believed in, with a decent budget, who were willing for the band to go into a good studio to record the album from start to finish with a single producer.” The last word has to go to Martin McAloon: “In its way, it’s like listening to Bacharach: there’s an ease of listening to it, but a complication in the chords and the melody. It’s fabulous, stunning and sophisticated, yet difficult to get your head around.” That’ll be Prefab Sprout, then. Nice recollections and a proper mythologizing of one of the great albums of the late 20th century. Thanks for sharing this! Who needs TV when you have T-Rex?